The Salida Council for the Arts is accepting applications until April 30th for a Performing Arts and a Visual Arts Scholarship. An application can be found on the SCFTA website. The $500 scholarship is open to any graduating student who plans to attend an accredited college or university in the fall of 2019 as a freshman, and who has participated in and benefited from Salida visual and performing art programs. mailed/delivered to Box of Bubbles 206 E St. Salida CO 81201. May 1 is the last chance to register to be a sponsor, restaurant or venue for the 27th annual Salida Art Walk June 28-30, 2019. Register today at SalidaArtWalk.org. Click the image below to visit the NEW Salida Art Walk website! This year is going to be AMAZING! ABOUT THE CREATIVE MIXER: Held every second Thursday, the Creative Mixer is a free monthly public gathering of those interested in knowing more about the local arts scene in a casual social setting. Anyone with information to share about upcoming creative and art-related events is encouraged to give a brief announcement. Attendees are welcomed to introduce themselves and may find new friends and collaborators at the “Mixer.” Free hors’ de oeuvres, a cash bar, beautiful artwork, great conversation, and music are always in abundance. FEATURED ARTIST: Photographer Joe Beakey presents his show, Colorado and the Southwest. He has been a photographer for eight years and his work has been juried into several noteworthy regional and national shows. Joe’s photography focuses on unusual angles and lighting for his subjects. He strives to take landscape photographs that are unique and have beauty and color to them. As for his black and white photographs, he tries to have intense lines and shadows, making a somewhat bold look. FEATURED MUSICIAN: Acoustic guitar instrumentalist John Drew Petersen has been touring Central Colorado with his unconventional "extended technique" approach for three years now. His third album, "Warble", is in the studio and set for an early summer of 2019 release. Enjoy a live listen to some of the looping, partial capos, free harmonics, cross-hand playing, and altered tunings that keep folks coming out to hear his creative approach, reminiscent to some of the "Windham Hill" school of instrumental music. John Drew Petersen’s Performance Schedule link is: https://jdpmm.blogspot.com/2019/03/john-drew-petersen-2019-performance.html. Come out for a tasty brew and help raise some funds for Salida Council for the Arts! Guaranteed to be a fun time…Help Spread the Word and Bring your Friends!!!! Salida Council for the Arts is accepting applications from March 1st to April 15th for the William Boddy Passion to Learn Scholarships. Boddy served on the arts council for many years until his death in September 2015. The scholarship is designed to fund individuals who want to share their artistic skills and knowledge by teaching community members in classes or workshops. In creating the program, the council board of directors focused on Boddy’s own desire to share his many skills and talents. Selections will be announced at the May 9th Creative Mixer at the SteamPlant Paquette Gallery. The scholarship is funded by community contributions and administered by the Salida Council for the Arts. Thank you to Mike’s Garage, Su Casa Furniture & Sleep Shop, Box of Bubbles, Pam and Don Dubin, Amicas Pizza, TJ Hittle Landscape Architects, Wood’s High Mountain Distillery, Eye Candy, Lisa Marvel, TLC Landscaping, Natural Habitat Designs, Salida Mountain Sports, Legends Kitchen & Bath Showroom and Broken Strings Guitar for providing annual support for the scholarship program. Mark your calendar for the Fourth Annual Boddy Jam on Thursday, Sept. 5, 2019….More details to come! To become a scholarship sponsor or to donate items for the Boddy Jam silent auction, contact Barbara Ewing at 719-207-3262. Click the Valley Visions logo for More Information, Entry Form & Opening Reception Poster! Luminous Silence - EJ Diadato Retrospective Friday, Feb. 1, 5:00-7:00pm 4 Locations for Receptions & Exhibits. Plan to attend this very important meeting! 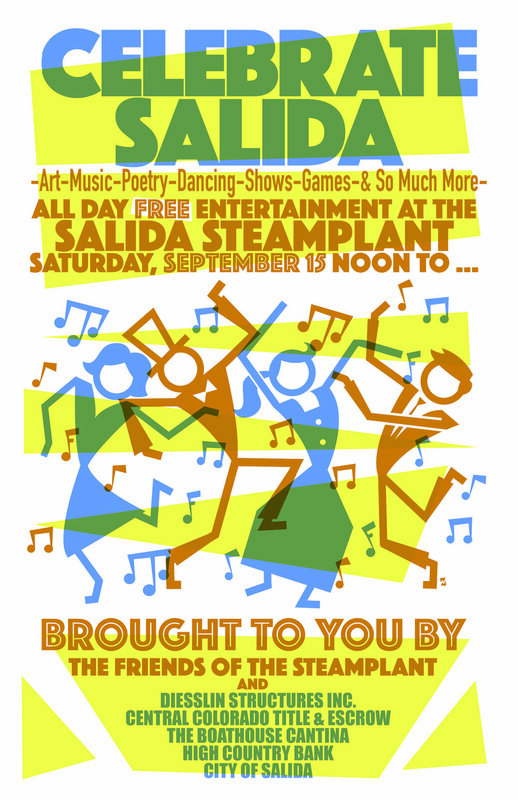 Salida Art Walk needs YOU! The Salida Council for the Arts (SCFTA) invites the public to attend the monthly Creative Mixer on Thursday, January 10 from 5:30-7:00 pm featuring artist Matt Kroschel and musician Mohan Ramprasad in the Salida SteamPlant Paquette Gallery. FEATURED ARTIST: Artist Matt Kroschel grew up in Chaffee County before heading out into the world working in television news as a reporter. Matt currently covers Colorado’s High Country and Western Slope for KCNC CBS4 in Denver. He lives in rural Grand County on a hobby farm that is home to rescue dogs, cats, chickens and ducks. Matt began his painting career on a whim in the summer of 2018. With zero formal art training or schooling, he breaks rules and pushes the envelope. Every piece is an original and unique. His style has grown into a well-recognized colorful mix of wild and farm creatures. His love of the natural world goes back to working as a photographer for several publications including the Mountain Mail before and during college. He began his artistic career on the stage of the SteamPlant before the renovations, when pigeons still called the big event center home and the floors were partially dirt. Matt and his partner Chris are active in the local community. They enjoy soaking at Mt. Princeton and sipping adult beverages at Elevation Brewery when they are back in the area to visit. FEATURED MUSICIAN: Mohan Ramprasad is a creator, and knows that love is the ultimate creative force in this dimension. His worldly duties include writing, recording and performing music, raising his son to be a good human being, painting the insides and outsides of residential and business structures, and instructing others in the phenomenon of self-directed neuroplasticity. Mohan is at his best when he is moving his body in an active and/or intentional way, existing out-of-doors in the mountains, forest or desert, and in learning situations. He is shy, yet thrives on human connections, so catch him, if you can, and say hello. The Salida Council for the Arts (SCFTA) invites the public to attend the Creative Mixer on Thursday, December 13th from 5:30-7:00 pm featuring artists Linda Gibas and Dave La Vercombe and Musician Megan Lombardo at the Salida SteamPlant Paquette Gallery. Held every second Thursday, the Creative Mixer is a free monthly public gathering of those interested in knowing more about the local arts scene in a casual social setting. Held in the Paquette Gallery of the SteamPlant, anyone with information to share about upcoming creative and art-related events is encouraged to give a brief announcement. Attendees are welcomed to introduce themselves and may find new friends and collaborators at the “Mixer.” Free hors’ de oeuvres, a cash bar, beautiful artwork, great conversation, and music are always in abundance. Featured Musician: Megan Lombardo is originally from Sherman, Texas and has been studying piano since the age of six. She has over 20 years experience as professional accompanist, collaborative instrumentalist, solo pianist, vocalist and songwriter. Megan attended Rhodes College in Memphis, TN where she majored in Music with an emphasis in Piano Performance. She was also a student conductor for the Rhodes Orchestra, Rhodes Singers, and Rhodes Master Singers, as well as a Rhodes College Fine Arts Scholar. After graduation, Ms. Lombardo spent five summers with the Bravo! Vail Music Festival in Vail, CO, first as a Marketing & Production Assistant Intern and then Festival Internship Coordinator, and with Music From Angel Fire in Angel Fire, NM as Production Manager. Ms. Lombardo has taught private and group piano lessons while living in Tallahassee and Gainesville, Florida, Denver, Colorado and is now accepting students in Salida. Megan is currently building her own studio at her home in downtown Salida, set to open Spring 2019. Featured Artist: Linda Gibas grew up in Denver, and always had the mountains in her blood. As a young girl, she would often ask her parents if they could move to the mountains and get a horse. Linda moved to Glenwood Springs to attend Colorado Mountain College where her interest in photography was sparked. She took numerous photography classes during her studies, always enjoying it as a treasured pastime. Linda’s photographs are done for fun, she says. She likes to represent a playful aspect in the capturing of the images. Most of them represent the outdoors, because that’s where she likes to be and feels there is so much to experience in nature that’s right before us that is often overlooked. Her intention for her show is to provide enjoyment with the images she is sharing. Featured Artist: Dave La Vercombe was born in Midland MI where his mom started him drawing at an early age. He excelled in both drawing and painting, winning a 3rd place ribbon in the Carroll County Fair Art Contest where he was competing among adults. The La Vercombe’s moved every few years, as Dave’s father’s job required transferring to manufacturing sites around the Mid-West. Dave had his art along for the journey and he said it saved his life a multitude of times. Dave works in his own shop and has worked professionally as a Darkroom Stat Camera Operator, Paste-Up Artist, Cartoonist, Illustrator, Sculptor/Carver for Fine Furniture, Jeweler Apprentice, Jewelry Shop Owner, Builder, Finish Carpenter and Dreamer and enjoys living, working, and hiking in and around Salida and will continue to be an artist in as many different forms as possible, till his last days here on Earth. 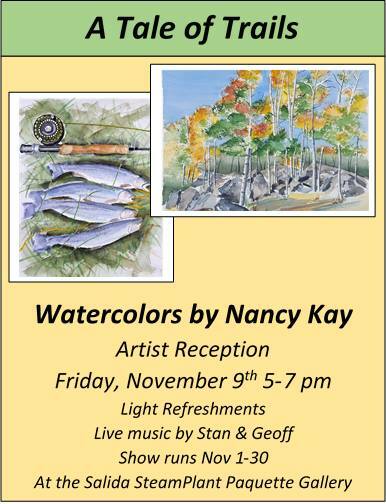 Please join Nancy for her Artist Reception at the SteamPlant Paquette Gallery on Friday, Nov 9th, 5-7pm. There will be refreshments and live music by Stan and Geoff, should be lots of fun! Her show, 'A Tale of Trails', will be shown at the gallery Nov 1-30. Hope to see you there! The Salida Council for the Arts (SCFTA) invites you to attend the Creative Mixer on Thursday, November 8 from 5:30-7:00 pm featuring artist Nancy Kay and musician Chris Nasca in the Salida SteamPlant Paquette Gallery. FEATURED ARTIST: Nancy Kay - Nancy’s show called “Tale of Trails” is a collection of watercolor paintings containing scenes from her adventures following trails, mainly within Chaffee County. Her favorite mode is hiking, mountain biking and skiing. Nancy loves being outdoors, and her love of nature inspires her paintings of old rusty trucks, landscapes, architecture and unique perspectives of objects. Painting in watercolor has been her hobby for over a decade, and she is now enjoying the freedom to pursue her creative passion. Now retired, Nancy spent her career in mechanical design focused on very precise drawings. Spending more time in the studio experimenting with color and shapes as well as studying in watercolor workshops has helped Nancy ‘loosen’ her painting style. Originally from Northern California, Nancy has called Salida home for 7 years. She enjoys anything outdoors and traveling with her husband and their three bird dogs. Nancy showed her art publicly for the first time in 2017 in Salida at the Pinon Real Estate Gallery. Since then, she has exhibited her work at the Diesslin Gallery, Mini Masterpiece, Valley Visions, Salida Wine Festival, and several local silent auctions. She looks forward to more shows in 2019 and becoming more involved in the local art scene. Chris plays guitar and vocals and his style is traditional roots, original, blues, jam and funk. He has a unique sound of storytelling of original, groove and traditional roots covers. His influences range from Peter Rowan, Eric Clapton, Jerry Garcia, The Meters, and the Grateful Dead. Chris moved from the Deep South of North Carolina and Alabama to Colorado in 1993 and has been a Salida local since 1996. He has had the opportunity to be a part of several local and talented blues, rock, folk, country and psychedelic groups including The Critters, Lil' Missouri, Rio, The Fractures with a CD released in September of 2008, Little Ernie and The Big Thang, Your Surrogate Cousin (YSC), and Alley Dust. He’s presently part of a four-piece jam band called Roundhouse Assembly, and also Nasca /Cooper, a guitar and piano duo. Chris has shared stages with The Radiators, Karl Denson Trio, Blackfoot, Andres Osborne, Bruce Hayes and many others. The Salida Council for the Arts is a 501c3 non-profit based in Salida, Colorado. The organization was founded in 2002 to facilitate community access to arts grants and other types of government and foundation funding. The SCFTA’s mission is to enrich the cultural life of our community by nurturing and supporting excellence in the arts; to increase the community’s awareness of and appreciation for the arts; to promote and encourage arts education; and to serve as liaison between the arts, business, government, and educational institutions. 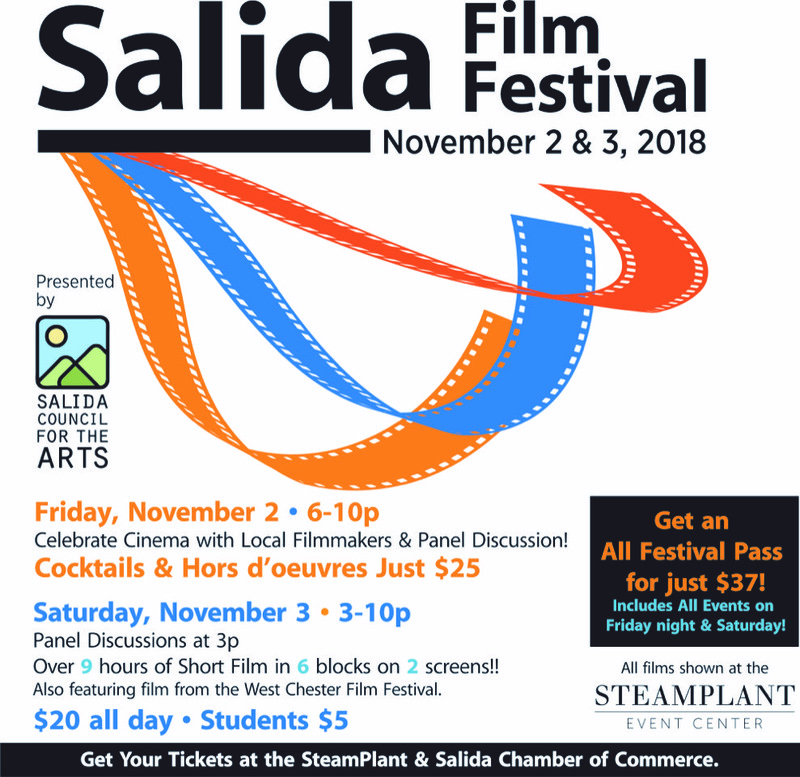 Salida Film Festival - Saturday, November 3rd. CLICK ON IMAGE TO SEE FILM FESTIVAL DETAILS! 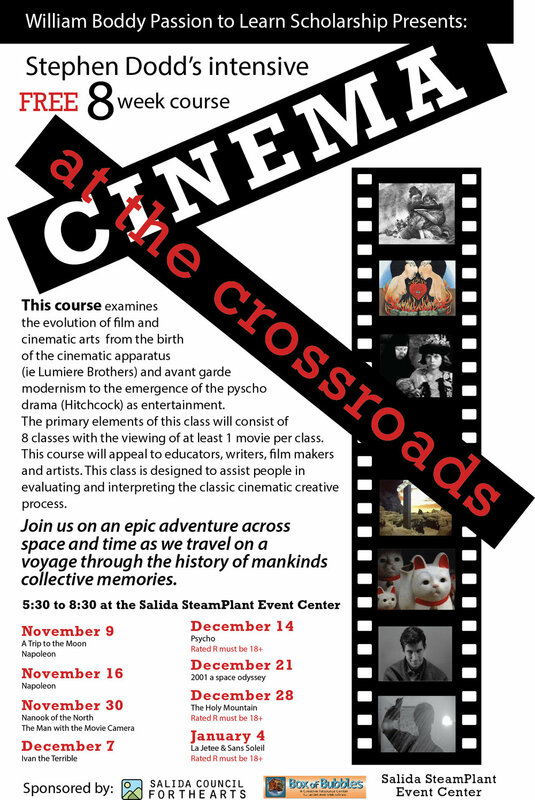 Salida Film Festival - Celebrate Cinema with Local Film Makers! Friday Night Kick-Off Event; Friday, November 2nd. (Doors open at 6:30pm) at the SteamPlant Theater. Cost: $5 at the door. Craig will present a slide show and discussion about his climbing trip to Bolivia: High Altitude Mountaineering and Cultural Acclimatization. Craig's proceeds from the evening will be donated in support of the proposed, Mountain Heritage Park, a Chipeta Mountain Project initiative. The Chipeta Mountain Project, its supporters and friends, held the Chipeta Rising Celebration in October of 2017, to honor the move of the name, “Chipeta Mountain” from its original, lower, non-visible elevation of 12,850’ to the prominent, unnamed point at 13, 472’, visible throughout the valley and to celebrate the history of the Indigenous people who lived in our valley. Stay tuned for more information about the Mountain Heritage Park initiative and its strategic and valuable contribution to our community. Please help spread the word, share and bring a friend to this evening of mountain climbing and cultural adventures in Bolivia! The Salida Council for the Arts (SCFTA) invites the public to attend the Creative Mixer on Thursday, October 11 from 5:30-7:00 pm featuring artist Julie Maas and musician TJ Hittle in the Salida SteamPlant Paquette Gallery. FEATURED ARTIST - JULIE MAAS: Julie’s fall show called “Art Harvest: My Creative Cultivation” is a collection of landscape, floral and still life paintings in pastel and oil. Julie’s childhood drawing memories are of standing at the dining room table drawing figurines selected from her mom’s hutch with her earliest instruction from her artistic dad. Pure pigment pastel sticks are her “go-to” for the immediacy of drawing and their vibrant, non-fading colors and rich, soft textures, especially for pet portraits. She also enjoys working in oil. 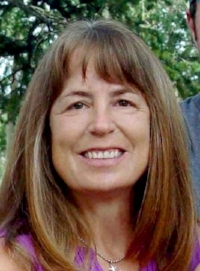 Julie earned her Bachelor of Fine Arts degree from Colorado State University and worked freelance graphic design while employed 25 years with the city of Loveland. She later retired from the State of NM and moved back with her husband Jake to CO in 2016. Julie serves on the board of the Salida Council for the Arts. FEATURED MUSICIAN: TJ Hittle is a licensed Landscape Architect and session musician who has been playing a variety of guitars since age 14. He moved to Salida in 2012 after playing professionally since 1964 across the Midwest. His music ranges from originals to soulfully played ballads in blues, jazz, rock, country, and Americana. He can often be seen playing solo or backing other groups at SoulCraft Brewery, Vino Salida, the Boathouse, Benson’s Tavern, Salida City Park concerts, the Salida SteamPlant and other Central Colorado venues. 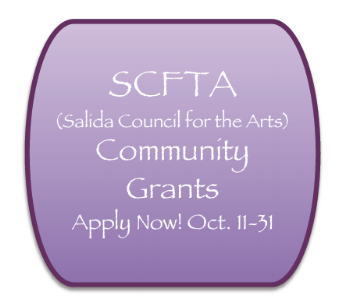 The Salida Council for the Arts (SCFTA) is now receiving applications for the second awarding of 2018 Community Grants. Grants of up to $500 each are open to applicants seeking funding for local arts and cultural based projects. These projects need to have a definable connection to the Salida Community and be supportive of the Council’s Mission Statement. Current applications are available online and must be received by Oct. 31. Successful projects will be funded in December 2018. The Salida Council for the Arts (SCFTA) invites the public to attend the Creative Mixer in the Salida SteamPlant Paquette Gallery on Thursday, September 13 from 5:30-7:00 pm featuring the Salida Fiber Festival’s Fiber Arts Exhibition and musician Jason Thies. ABOUT CREATIVE MIXER: Held every second Thursday, the Creative Mixer is a free monthly public gathering of those interested in knowing more about the local arts scene in a casual social setting. Held in the Paquette Gallery of the SteamPlant, anyone with information to share about upcoming creative and art-related events is encouraged to give a brief announcement. Attendees are welcomed to introduce themselves and may find new friends and collaborators at the “Mixer.” Free hors’ de oeuvres, a cash bar, beautiful artwork, great conversation, and music are always in abundance. 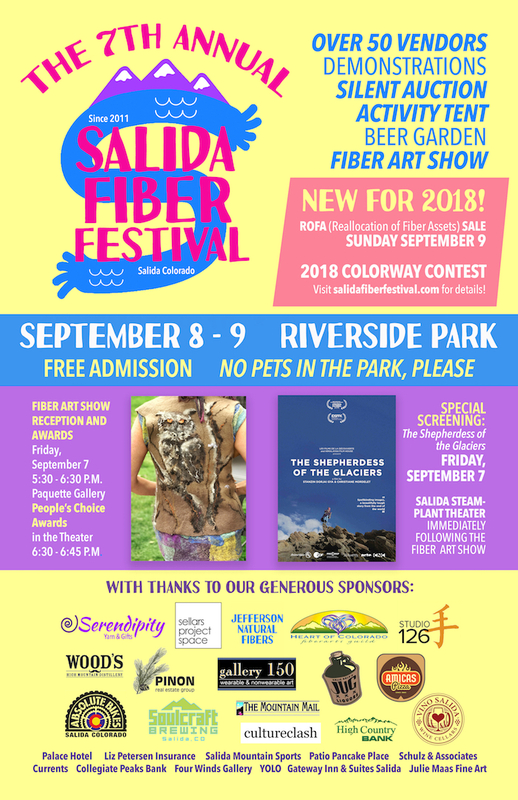 FEATURED ARTISTS: For the third year, the Salida Fiber Festival is proud to present the Fiber Art Exhibition featuring fiber art in its many forms, including spinning, knitting, weaving, dyeing, felting, sewing, beading, and repurposing. Entries come from local fiber artists and vendors at this year’s festival, and are both 2-D and 3-D in form. FEATURED MUSICIAN: Jason Thies is a guitarist, singer and songwriter from Durango. Since 1999 he has released 4 albums of original music, two of which are available through iTunes. Recently his music was aptly described, “...it is excellent; a wonderfully rootsy, bluesy, and exuberantly hook-filled sound." Thies was a member of The Assortment for 11 playing a wide variety of popular songs from the 1930's on into the 21st century, as well as many original compositions. The group is now called 4D3. They continue to play their eclectic mix of tunes throughout the 4 Corners, and performed at numerous outdoor shows this summer. Jason also performs solo, and appeared weekly at the Far View Lodge in Mesa Verde National Park the last two summers. He has lived in Austin, Texas and Nashville, Tennessee performing at many popular venues that include the Bluebird, Cactus Cafe, Douglas Corner, the Hideout, Ruta Maya, and others. Currently he is writing and recording music for his 5th album.